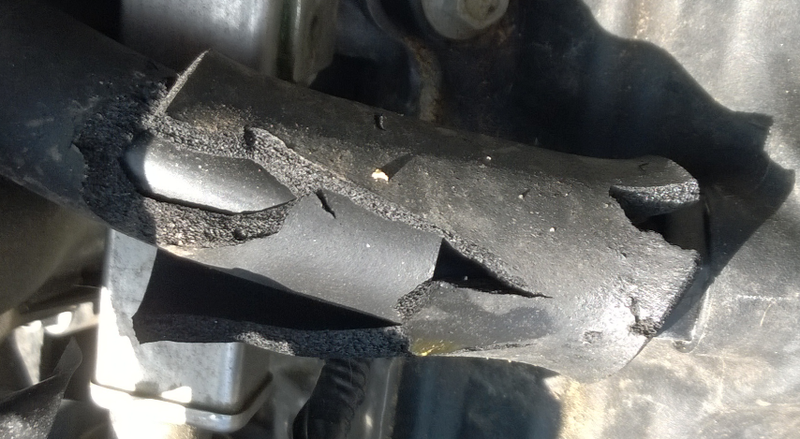 Sometimes you experience sluggish performance for no apparent reason. That are usually the harder issues since it is not clear what is causing it. Things will become a bit messy but I will give some advice how you can pinpoint sluggish system performance with basic OS tools and some advanced tools which are rarely used in public. 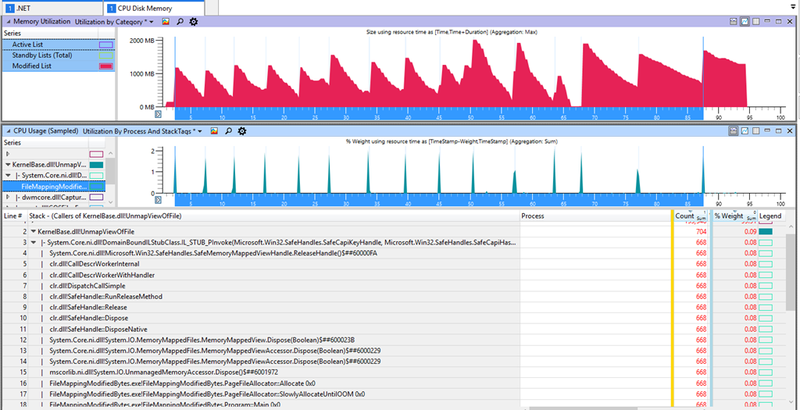 A server machine did become very slow once the in use memory reported by task manager reached ca. 70% (e.g. 90/128 GB) of the available memory. There was still plenty of free memory but when a new application was started it was very slow and the C drive was very busy. A first suspicion was that the application dlls were loaded from disk again which did not really make sense since the application was started many times before. Everything should be in the file system cache since a long time. 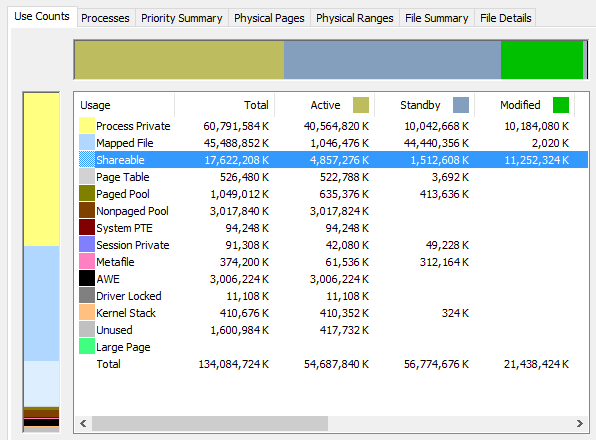 A closer look on disk IO in the task manager showed that the drive hosting the page file was from the very beginning having writes to the page file at ca. 90 MB/s. We certainly did page out a lot of data but why was this happening when only 50/128 GB were in use? To see where the memory is going to we can use RAMMap from Sysinternals. It can show system wide memory consumption of processes and the kernel as well. This is the only tool which can show also the lost memory because if it is allocated it must belong at least to the kernel which is also shown. Here we find that the modified memory is coming form Shareable memory. Shareable memory is memory which is not backed by a physical file. The only possibility I am aware of to create such memory is to create a file mapping with no file name which creates a page file backed shared memory section. The suspicion here is that we have lost memory to page file backed sections which did land for some reason in the Modified list which is the sign for the kernel to write them back to their backing store. In this case it is the page file which nicely supports our theory because we have high page file write rates. That is all nice but the question is which process is doing this? When I did look with Task manager through the processes I found no process with a very high Commit or Working set memory. If nothing helps try to reproduce the problem in isolation so you can better analyze it. The easiest repro is to create a file mapping, which is mapped, written to and then unmapped but the file mapping object is not closed. 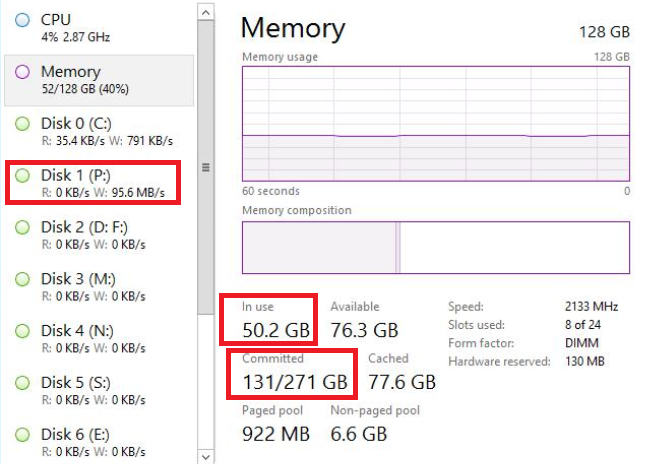 // by Windows 10 memory compression to see the real impact of memory allocation. The full source code can be found here https://1drv.ms/f/s!AhcFq7XO98yJgfZdGGK8ahaOrVnggg. With this sample application we can indeed nicely reproduce the issue that every time the memory is unmapped the kernel takes our mapped memory from the process working set away and puts it into the modified byte list. Now depending on the OS different things happen. On Server 2008-2016 the memory is immediately written to the page file. On Server 2016 you could enable memory compression also if you wish (see https://aloiskraus.wordpress.com/2016/10/09/how-buffered-io-can-ruin-performance/). On Windows 10 machines on the other hand the memory is compressed by default and kept in memory which is much later written to disk once physical memory gets low. Since we have reproduced the symptom we can search for ways how to find the offending process more easily. Nope not a single number which points towards high memory consumption. That is not surprising because the memory was already unmapped and no longer belongs to any process. But our process still has a file mapping handle open which is reason enough for the kernel to keep the data alive. Lets take a dump and look for file mapping objects. In kernel lingo these are called Section objects. To dump all file mappings and their size we can use the !handle command. The first argument 0 means to dump all handles, 0xf to dump all handle information and limit the output to file mapping (Section) objects only. We can sum up all open file mapping objects manually or use a pretty unknown Windbg extension called mex (see https://www.microsoft.com/en-us/download/details.aspx?id=53304). Mex is a Windbg extension written in managed code which is the reason for its name (managed extension). It is used by support engineers within MS quite a lot because it contains a lot of functionality in a single dll, which makes deployment pretty easy. It can even decompile C# code with some help from ILSpy from a memory dump which is pretty useful. When you have downloaded the zip file put the dll of the right bitness into the Windbg\winext folder where Windbg stores its extensions so you can load it simply by its name. The !sum command is pretty self explaining. !cut will cut from each line the number by a fixed offset and length of all lines which are filtered for the lines which contain the size with !grep from the !handle command. This reminds me of old linux days where my command lines looked pretty similar like the Windbg commands above. is not showing anything related to 19 GB of allocated shared memory. If you suspect only one process which is responsible for that you can use Windbg and check out if the process has a file mapping leak. If this is a problem you did either forget to close the file mapping, or someone was unmapping the shared memory too early. You can set breakpoints on Windows 8+ at kernelbase or on earlier Windows version at kernel32 where the methods are actually defined. Windows 8 introduced API sets (https://msdn.microsoft.com/en-us/library/windows/desktop/hh802935(v=vs.85).aspx) which allows the OS guys to split formerly huge dlls into smaller parts where the implementation might be in a different dll. You need to be careful to set the breakpoints at the right location depending on the OS you are currently working on. Someone creates page file backed shared memory as file mapping. These file mappings are put into the address space of our process with MapViewOfFile. After usage the file mapping is removed from the process working set with UnmapViewOfFile. The file mapping object is closed much later or never. The kernel removes the memory pages from the process working set and moves them to the Modified List. No process owns that memory anymore and the OS is free to page it out to the page file. After the modified pages were written to disk they are put into the standby list, overwriting other previously cached things. The picture below shows the basic operations the kernel performs. The end result is that the unmapped memory from our process is written to the page file and at the same time it is put into the file system cache where it replaces older entries. This has far reaching implications. If you unmap the memory but do not close the file mapping object almost at the same time the OS will page the memory out if no other process has the same memory mapped. An innocent file mapping handle leak with large memory mappings can flush your complete file system cache at random times and there is no clear indicator why your or other application suddenly did become much slower. 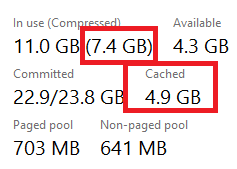 On Windows 10 Anniversary and later you can see the effect of flushing the file system cache more directly by looking at the task manager when the compressed memory goes up and up but the cached memory stored in the standby list is becoming less and less. Fresh paged out memory seems to have the highest priority in the file system cache which can overwrite anything else what was inside it. This is also true on server OS where you can check with Rammap that the file system cache was flushed. That explains why we were having so much read activity on the C drive because our file system was flushed and the application dlls needed to be loaded from disk again. If you have a large amount of compressed memory in Windows 10 but not much In use memory the chances are pretty good that you have a file mapping leak somewhere. On my Windows 10 Anniversary machine I can nicely see that my paged out memory directly goes into the working set of MemCompression (Memory Compression in Process Explorer, Hacker) which is not shown by the Windows task manager. At some point it is so huge that it needs to page out memory to my SSD with up to 400 MB/s. 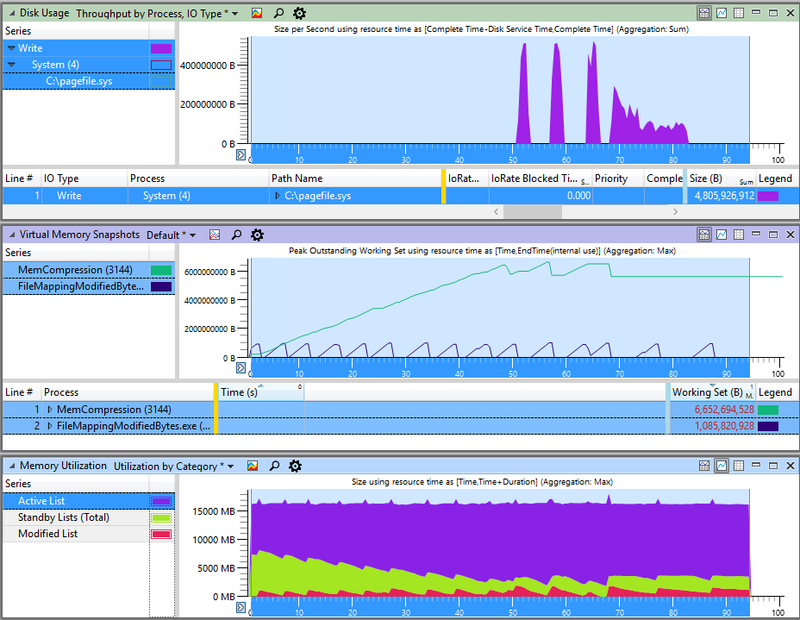 While MemCompression (purple) allocates more memory, the standby lists (green) becomes smaller and smaller. The blue bars map perfectly to the rise of modified bytes when we unmap a file section. You can also treat the file mapping issue as handle leak where you can trace with ETW Handle Leak tracing all Section objects which call CreateFileMapping which can be used to verify that no file mappings of this type exist anymore to verify that a fix works as expected. WPA is the perfect tool to visually correlate different metrics to check if there is a dependency. You can come up with a theory what depends on what, graph the different things underneath and then you see a pattern …. or not. Then it is time for the next theory. Problem solved? Only partially. This only explains sluggish behavior when the machine gets into high memory load which then flushes the file system cache. But there were issues right from the beginning even when there still was plenty of data in the file system cache. Can you spot based on the given data above where the problem is? but it was about 5 times slower than usually. Perhaps one disk did fail and the RAID was not scaling properly anymore? Nope. 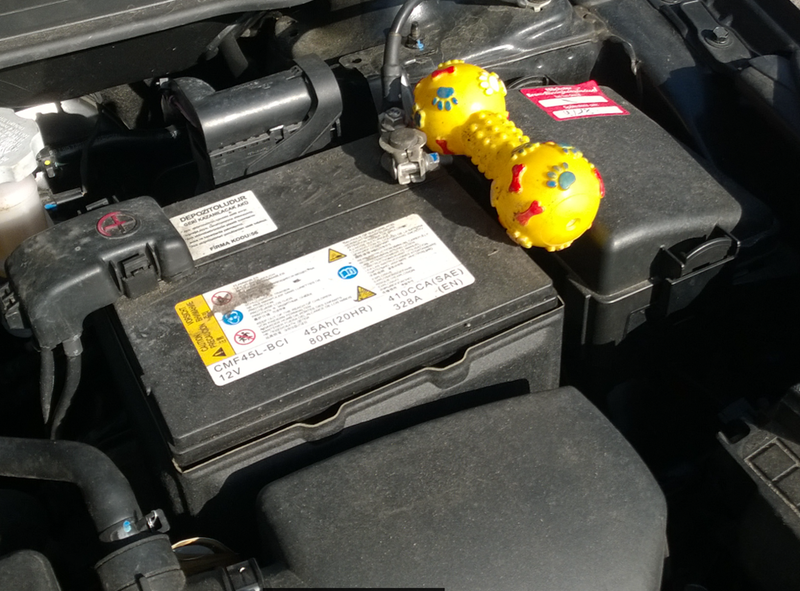 But there was a warning logged somewhere that the RAID battery has failed. The battery in the RAID is there to write all cached data from its internal DRAM cache to the disks in the case of a power failure. 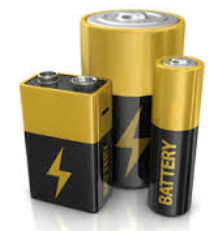 What happens if the battery fails? The RAID turns off its internal cache to prevent data loss if there is a power failure. We were therefore running the sever the whole time without a much wanted cache! I am not the one to take credit for finding the disabled RAID cache. It is all about teamwork where everyone looks at different aspects of a problem to (hopefully) find all issues. Thanks for finding that one. You know who you are. That setting enables the RAID cache regardless of the state of the battery which is exactly what we want. In fact the battery was not broken but opening the server and dusting off the battery did solve the battery issue as well. When you write software it is not always the software which causes a change. It still runs on hardware which can change/fail too. You need to monitor not only yourself but also the environment where it is running. If you fail to take that into account you can search for a long time at the wrong or not most significant spot. 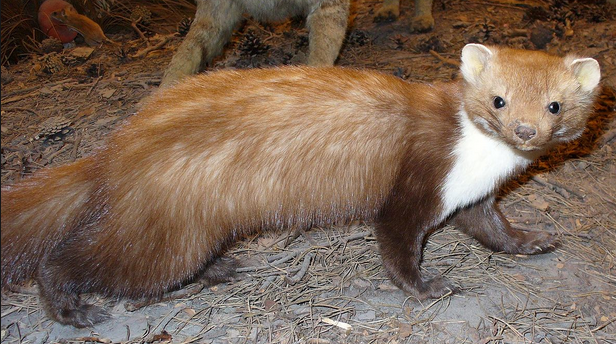 Have a nice day and keep your hardware marten safe.